Rachel Carson (b. 1907–d. 1964) is one of the most famous women naturalists. Her book Silent Spring documented the devastating effects DDT had on the environment. Because of Silent Spring, DDT was banned for agricultural use in the US. But Rachel Carson, a trained biologist, was also an artful writer whose first love was life in the sea. She wrote three books focused on life in and around the ocean. Her book The Edge of the Sea (from which the following quotes are pulled), captures the fleeting beauty of life in this unique ecosystem. Life where the sea meets the shore is brutal. Survival requires adaptation to both full submersion in the salty sea water, and baking dry in the heat of the sun. And in between, there is the relentless hammering of the waves. For biologist and writer Rachel Carson — whose love of the sea still could not convince her to enter into it any more deeply than her knees — the edge of the sea was like home. She knew every nook and cranny of that home, including the one room that was open for only a fleeting moment under the perfect conditions. In the twilight between the darkness of the night and the dawn of the sun, Rachel Carson waited on the shore, near what she called “the fairy cave.” The moon was full, pulling the tide to its lowest point. This was key. 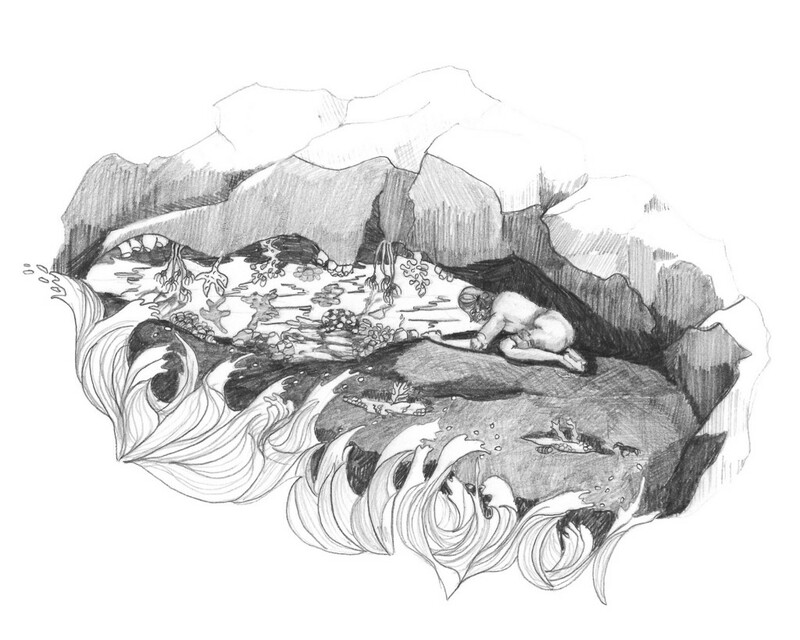 The fairy cave held within it a rarely seen tide pool filled with exquisite, delicate creatures. But it could only be accessed “rarely and briefly when the lowest of the year’s low tides fall below” the entrance. This was one of those rare times. Finally, as the sun peaked over the horizon, and the tide ebbed, Rachel traversed a slippery, seaweed-covered ledge that emerged from the receding water. This led to the mouth of the fairy cave. Art by Sarah Pedry. Words by Sarah Pedry and David Obuchowski.